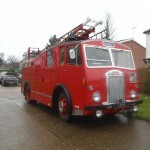 Lodge Brothers in West Byfleet recently conducted the funeral of the late Frank Williams, who was a retired Fire Officer. The funeral procession was accompanied by two fire engines, one vintage and one modern-day, and the coffin was draped with a flag and topped with a vintage metal fire helmet. The family commented on how thrilled they were to be able to give him the send off he deserved.